Would you like to help out at CLAPA, but aren’t sure how much time you can commit? Would you like flexible, short-term, local opportunities sent your way? Do you want to learn more about the charity sector and get valuable experience for your CV? Sign up today to join our bank of CLAPA Helpers, and get alerted about casual opportunities to help out at times that suit YOU! Any other events or activities where we could use a few extra people! It couldn’t be simpler – you fill in our short form telling us what kind of things you’re interested in, we’ll add you to our ‘bank’ of Helpers, and we’ll send out an alert when there’s an opportunity we think you might like. There’s no pressure, no commitment, and you can opt-out at any time. Some of these opportunities might come from CLAPA Staff, like cheering on runners at a local race, and some might come from CLAPA’s volunteer-run Branches or other groups, like if they need someone to be Santa at a Christmas party. There’s a role to suit every schedule and skill-set! This is an easy, flexible way to help CLAPA make a difference in your area, meet new people and try new things – sign up today to see what kind of difference you could make! 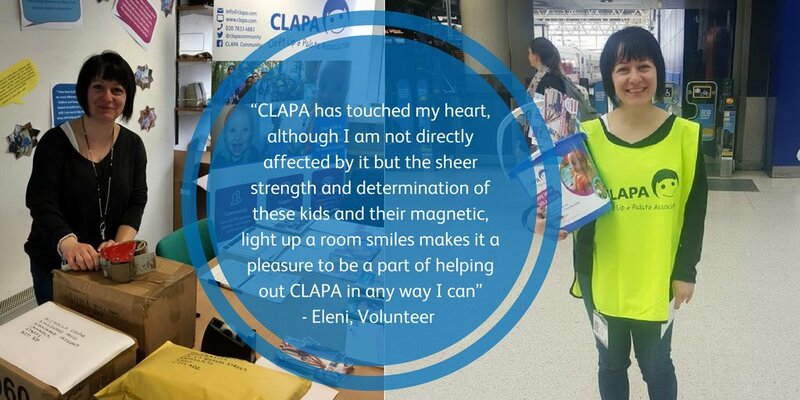 Note: This is not a formal volunteer role with training and supervision, so while you’d be supporting CLAPA, you would not receive a Volunteer ID Card, nor would you be officially representing CLAPA at events. This is, however, a great way to learn more about our range of volunteering opportunities! Join the CLAPA Helpers Bank today!